State Representative J.P. Sredzinski proudly represents the 112th General Assembly District covering Monroe and Newtown. He was elected for his third term in November 2018 and is currently a member of the Legislature’s Human Services and Higher Education & Employment Advancement Committees. He also serves as Ranking Member of the Public Safety Committee. In 2016, Sredzinski was honored with an EMS Legislator of the Year Award. In both 2016 and 2017, he was also named the Police Chiefs Association Legislator of the Year. Sredzinski was on the Monroe Town Council since 2005, serving as Chairman from 2013 to 2014. He has also been Chairman of the Monroe Police Department Building Renovations Committee, Secretary of the Town Council Finance, Education, Health and Public Safety Committee, an appointed Member of the Connecticut Emergency Medical Services Advisory Board and a Justice of the Peace. 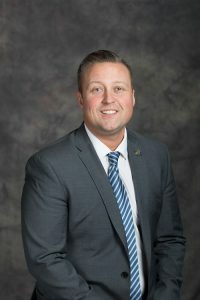 Previously, Sredzinski has been a Monroe Representative to the Greater Bridgeport Regional Planning Agency as well as an alternate on the Monroe Zoning Board of Appeals. J.P. has also been a manager and an executive Board Member with Monroe Little League. He is a sixteen year Monroe resident and holds a BA and MPA from the University of Connecticut. Sredzinski is currently the Public Safety Dispatch Supervisor for the Town of Stratford.